I find aubergines very difficult to grow outside in Brighton but there are cultivars such as ‘Bonica’, which is an early cropping variety recommended by the RHS as suitable for indoor or outdoor cultivation. There is also a lovely cultivar called ‘Fairy Tale’ that has won the award of garden merit, and has purple and cream striped fruits and this one is suitable for growing in containers. I find that they are best grown in a greenhouse or poly tunnel, but sow the seed as soon as possible in modules and then transplant them into 9cm (3 ½”) pots. I sometimes cheat and buy them from Ferring Nursery (ferringnursery.co.uk) Littlehampton Road, Ferring near Worthing – they always have some really good annuals there; lots of different tomato varieties, peppers and aubergines as well as lots of other interesting plants to choose if you don’t have the facilities to grow your own seedlings. If you buy your aubergine plants don’t put them outside until June when danger of frost has passed. You can also get aubergine plants that have been grafted, although these are expensive they are said to cope with bad weather conditions better and also fight disease. 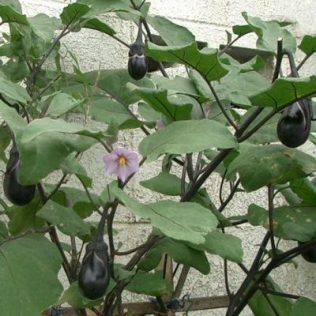 You can plant your aubergines when about 10cm (4”) tall into either grow bags or large pots. Stake and tie in the plants as they grow. When the plants reach about 20cm (8”) high you need to pinch the tops out and this will encourage the plants to put out stems down below which will ensure they make more fruits. Make sure you water them regularly, and then feed them as soon as the first fruits appear, I use maxicrop as an organic seaweed feed but you could use a tomato feed such as tomorite or some comfrey tea. With any luck by August you should have some lovely fruits to harvest it is a real worry with the drought this year and it could have a huge affect on crops. It is really important that everyone installs a water harvester or some sort to try and save as much water as possible.